Budding entrepreneurs are being given a free helping hand to develop their start-ups with the launch of Scotland's first business accelerator programme. Entrepreneurial Spark will provide free workspace, IT access and mentoring and advice from leading businesses. 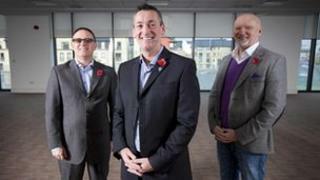 It is being launched by entrepreneur Jim Duffy, with support from top business figures such as Sir Tom Hunter and Willie Haughey. The not-for-profit company aims to help start-ups through their early years. Up to 20 entrepreneurs will be invited to take part in a 16-week accelerator programme, which will run every six months. The Entrepreneurial Spark will be based in the Gorbals, Glasgow, where Mr Haughey has given over an entire floor of his City Refrigeration headquarters for the project. Mr Duffy explained: "The whole ethos of the Entrepreneurial Spark is helping start-ups to get to their first and second birthday. "We have wrapped around a whole lot of business professionals - we call them ambassadors - legals, accountants, PR firms. "The whole idea was that these people would come on board, give free stuff, support Entrepreneurial Spark and then support the start-up chicklets, as we call them, that want to go through our hatchery." Mr Duffy said the programme was an alternative for start-ups who might otherwise go to consultants to develop their businesses. He continued: "Some of these young businesses pay for expensive business plans and for start-up advice and it's not really what they need. "Before they even get started and get a customer, they have got all these heavy bills to pay - they can't get leases, they can't get property, they don't have strong covenants. "The idea is that we worked out all the blockers, all the barriers to them starting their business, and this space is it." He added: "Willie Haughey is going to give them space, desks, IT support and we'll give them phone lines, mentoring, subsidised coffee, free parking - there is everything they need to start their business if they are serious." Mr Duffy said the programme was not looking for high-growth or high-tech businesses but "high-growth individuals". He added: "When someone walks in the door, you can tell if they are the real deal, or you can tell if someone has the potential to be that. "They will be sparky, they will have an idea, they are willing to collaborate - that's a big one in Scotland." Mr Haughey commented: "A fair number of young companies die very early unfortunately and what we are trying to do here is take away barriers such as cost. "Over the years we are probably going to put £1m into this project, but if we get one, two or three decent companies out of here that create 20, 30 or 40 jobs, then it will be money well spent."